Of cheap plonk and vintage writing. Well that is as long as you haven't drunk a vintage bottle recently. Then you know you are drinking slops by comparsion. Your first attempts at writing sound good. Well that is a long as you haven't read a good book recently. Then you know that your first attempts are slops by compairson. 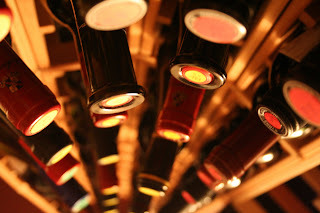 Some wines mature with age, mellow become richer. Put them away and drink them in 5 years time. Some writing matures with age, mellows becomes richer. Keep putting it away and then trying again until it becomes a vintage. 1 Read, read and keep on reading. Try and read good stuff, develop your palette. 2 Like some cheap wines, that just get worse with age as they go off, some of your early writing is never going to be ever good no matter how long you work at it. Pour it down the drain. 3 Sift out the potentially good stuff and let it mature. 4 Drink good wine, even with chips. I have some of what I used to write in my diary and when I re read it I'm seriously laughing at the drama that was me.